The newly revealed donor list showed the group received checks from Amos B. Hostetter Jr., the former cable television magnate from Boston, who gave $2 million; Seth Klarman, the billionaire chief executive of Baupost Group, a Boston hedge fund, who donated $3.3 million; and Alice Walton, an heiress to the Walmart fortune, who gave $750,000. The group was also forced to reveal its donors — showing it was anonymously receiving major checks from two Baker administration officials and numerous wealthy contributors from the world of high finance in Massachusetts, New York, and other states. Paul Sagan, a technology executive who was appointed by Governor Charlie Baker as chairman of the state Board of Elementary and Secondary Education, which oversees charter schools, donated $496,000. Mark Nunnelly, a former Bain Capital executive who was recently promoted from his position as Baker’s chief information officer to a Cabinet post overseeing cybersecurity, gave $275,000. Nunnelly’s wife, Denise Dupre, contributed $275,000. As a general rule, nonprofits such as Families for Excellent Schools-Advocacy, or FESA, are not required to disclose their donors if they are not engaged directly in political activity. However, state campaign finance officials said an investigation revealed that FESA was soliciting checks specifically to support Question 2, which would have allowed for the creation or expansion of up to 12 charter schools per year in low-performing school districts. Therefore, officials said, the group had violated the law. In addition to paying the fine and revealing its donors, the group agreed with the IRS to dissolve itself, and Families for Excellent Schools, its umbrella group, agreed not to fund-raise or engage in any election-related activity in Massachusetts for four years. Baker, who strongly supported Question 2 and appeared in one of the ballot question’s closing campaign ads, said Families for Excellent Schools was responsible for violating the law — not the members of his administration who donated to the organization. Families for Excellent Schools has promoted charter schools across the country. In New York, it spent $9.4 million on lobbying in 2014 and ran ads blasting Mayor Bill de Blasio for his opposition to charters, while praising Governor Andrew Cuomo for supporting them. The group was chaired last year by Paul Appelbaum, principal of Rock Ventures LLC, a New York investment firm. Its vice chairman was Bryan Lawrence of Yorktown Partners, another New York investment firm. 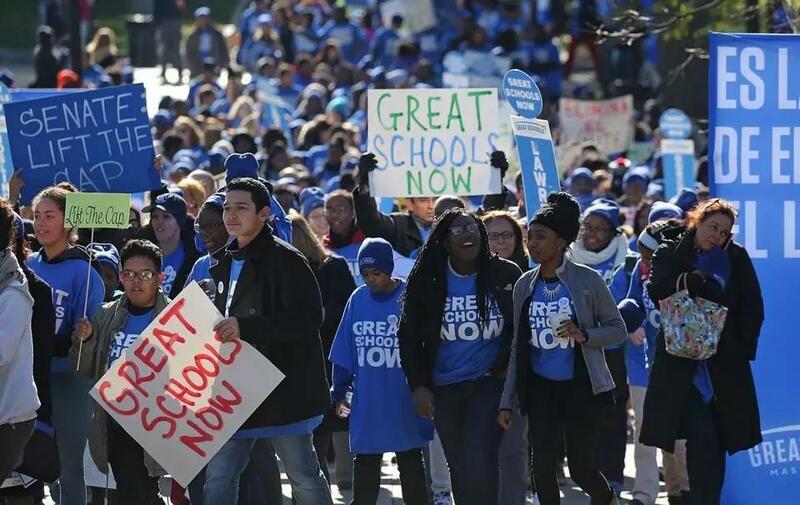 In Massachusetts, the $15 million that FESA spent on Question 2 represented 70 percent of the $21.7 million in donations collected by the main pro-charter ballot committee, Great Schools Massachusetts. Some of the money was used to run ads that featured images of a racially diverse group of children in a classroom. Teachers unions poured more than $15 million into the campaign to oppose Question 2. Voters roundly rejected the question, with 62 percent opposed in November. After the election, state campaign finance officials subpoenaed bank records from FESA that showed it was raising money from donors and then giving it directly to Great Schools Massachusetts. Great Schools Massachusetts, unlike FESA, was required to disclose its donors. So those who donated to FESA avoided having their names revealed during the campaign. Maurice Cunningham, a political scientist at the University of Massachusetts Boston, said the cloak of secrecy helped Families For Excellent Schools-Advocacy project an image as a grass-roots organization focused on helping urban youth. “You can’t say, ‘We’re Billionaires for Excellent Schools,’ ” said Cunningham. On Monday, Sagan released a statement acknowledging he had also donated to FESA. Cunningham said he hoped the fine would curb the role of so-called dark money in state elections. “Citizens have a right to know who is trying to influence their votes,” he said.